But what truly struck me about her story was this line… “I feel like all the roles that define me right now are roles that would have defined me even if I was a mother to a baby.” Wow! What an amazing revelation! We dealt with infertility and failed adoptions for about 8 years. I was 27 when we first started trying to get pregnant. After a year of nothing but temperature charts and negative pregnancy tests, my doctor finally looked a little closer for a problem. Initially, I was diagnosed with PCOS and given Clomid, which did nothing. Finally, I was sent to a specialist where I was diagnosed even further with fibroid tumors, endometriosis, and a uterus that was divided in half. After several IUIs, we were done with the medical approach. So, we decided to adopt. In my heart, I really felt this was the way for us to go. After filling out mountains of invasive paperwork, having our friends write recommendations, having home visits, and spending a lot of money, we were on the list for a baby. Unfortunately, this did not go our way either. Even though we were put in touch with birth moms who chose us to raise their baby, every single birth mother changed her mind. That happened no fewer than 12 times. After 8 years, we decided that we were happy with being Karen and Erik. We knew it was time to be done. I am a wife, daughter, dog mom, sister, favorite auntie, friend, teacher, runner, and part-time yogi. My family includes my husband of 15 years, Erik, and our sweet puppy, Ryder. I live in a fantastic neighborhood in Chicago, full of dogs, running trails, and amazing shopping and restaurants. I love to hang out with my family and friends, go to brunch, find fun, new breweries, read, watch TV shows on Bravo, take weekend trips, travel to Disney World, and laugh a lot!! I feel like all the roles that define me right now are roles that would have defined me even if I was a mother to a baby. I feel like all the roles that define me right now are roles that would have defined me even if I was a mother to a baby. I’d still be a wife and the fun auntie, a runner and part-time yogi. It is almost like I had to remove “mother of a baby” from my list of roles. It wasn’t easy, and it required seeing a therapist, attending a support group, lots of journaling, and working through some pretty intense emotions. 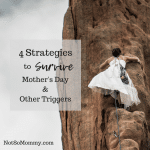 My therapist encouraged me to “twist the kaleidoscope” on how I viewed not being a mom–to focus on all the things I have, not the one thing I don’t. And what I have is pretty fun!! My plan B is pretty fantastic. I am embracing all that I have and look forward to the future. Erik and I moved back to Chicago after living in downstate Illinois. This was a huge step in our Plan B. Downstate, we were surrounded by families and children, as we lived in a subdivision with a good school district. We knew that moving back home to a larger city was the way to go. We live in a high-rise condo with views of Lake Michigan. Our building is full of dogs, not so much kids. 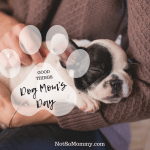 My Plan B includes having an awesome relationship with my husband, spending time with my dog, being a fun aunt, and spending time with family and friends. I think a huge perk of infertility is my marriage. Erik and I really grew together and leaned on each other during the hard times. I feel like sometimes, married people with kids seem like two ships in the night, celebrating when they get one date night a year. Every night is date night for Erik and me. Our relationship is our top priority, not who is driving a kid to soccer practice. One struggle I have with my Plan B is with my career, as I teach. Sometimes, teaching brings me such joy. Sometimes, I am ready to try my hand at something new… Any ideas? 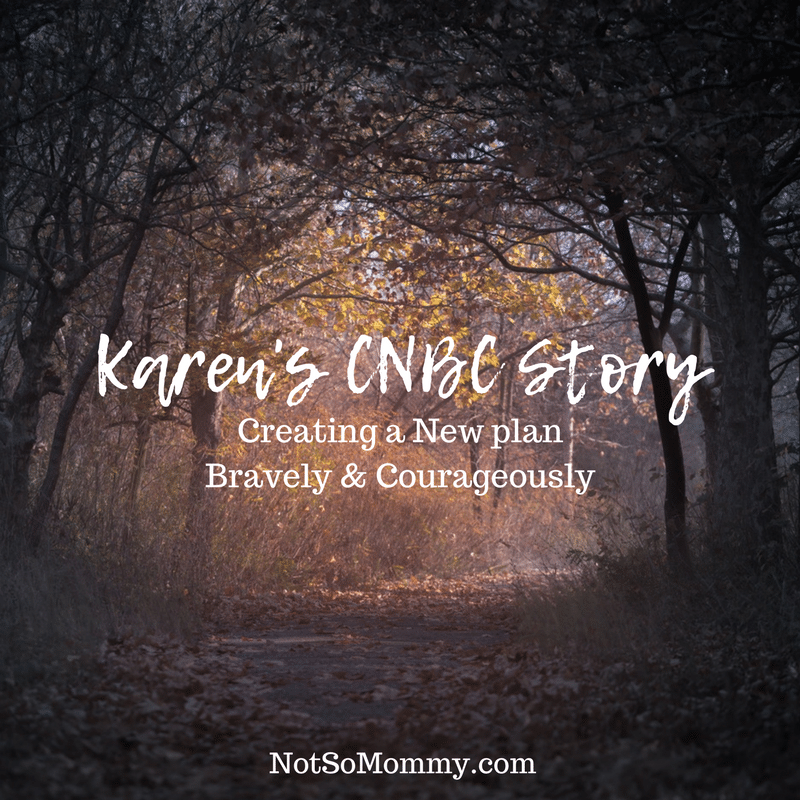 Karen, you are most definitely Creating a New plan Bravely & Courageously! You rock, girl! Want to inspire others and share your story? Click here to find out how. I have known Karen for years and think she is truly amazing. I admire her courage and her positive, fun loving spirit! I’m so happy for her move to Chicago and can’t wait to hear about all the new adventures that come from “plan B!” I believe that others going through similar situations will truly benefit from Karen’s story & experiences and hope she will begin/continue to blog. All the best to you Karen!!! Here’s to your new adventure!! This is a really neat story. Learn is also an awesome daughter-in-law! I love the term “turn the kaleidoscope.” Our lives can be full of joy and happiness if we just take a look a little differently. That was one of my favorite lines, as well!